First off, let me just say how lucky I am to be working at POPVOX this summer. A scavenger hunt across the Hill on the second day of my job? Yes, please. 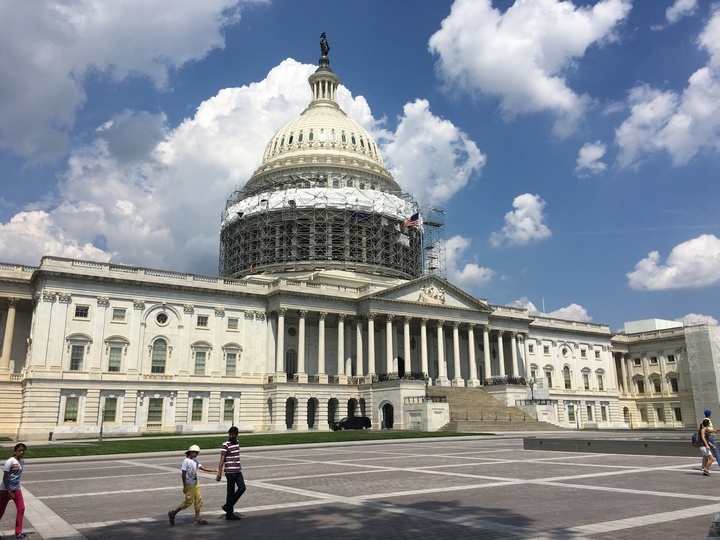 I started my internship a week later than Holly, so fortunately for me, I had a bit more time to figure out the Hill’s labyrinthine underground tunnels and bizarre building numbering system (Why is Longworth “1” on the House side when Cannon was the first to be built? Beats me.) I know I have a shoddy sense of direction—I’ve walked to work for the past few days with Google Maps navigation open on my phone—so I welcomed the opportunity to find my bearings before Congress returns from recess. 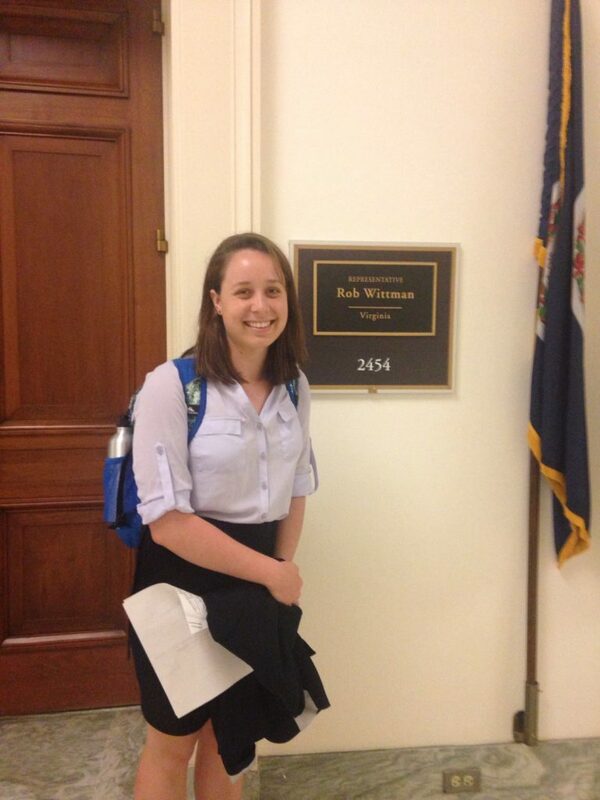 When I arrived at the Rayburn cafeteria (I didn’t get lost! Thanks, Google Maps.) on Wednesday morning, Whitney (our lovely supervisor) had given us a worksheet to fill out before we got started on our scavenger hunt. Several of the questions asked us to research the acronyms for committee names. OGR? E&C? T&I? HSGAC? HELP! * I’m a millennial, so naturally, acronyms should be my jam, but I already felt a little bit clueless before we had even started our trek under and across the Hill. After finishing up our worksheet and planning our route, Holly, Maddie, and I took off. We started on the House side, wandering up and down the corridors in and the tunnels under Rayburn, Longworth, and Cannon until we came across the offices of our representatives and the hearing rooms Whitney had asked us to find, taking selfies outside of each destination. 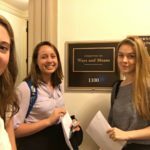 Passing by and selfie-ing (© Hannah Gourdie 2016) in front of offices with open doors was always exciting, as we got to see Congressmen and women’s office decor—a fan favorite was a representative from Maine who had put up a Maine license plate and buoys in his office. Still, coordinating selfies outside of open offices definitely garnered some exasperated looks and raised eyebrows from staffers. Next, we emerged from the dimly lit tunnels under the House office buildings and crossed over to the Senate side, taking this beautiful picture in the process. Eventually, we made it to Russell, and with some navigational and awkward-selfie-outside-Congressmen’s-offices experience under our belts, we got to work finding our senators (s/o to Sens. Mark Warner and Tim Kaine!) and the other hearing rooms on our list. 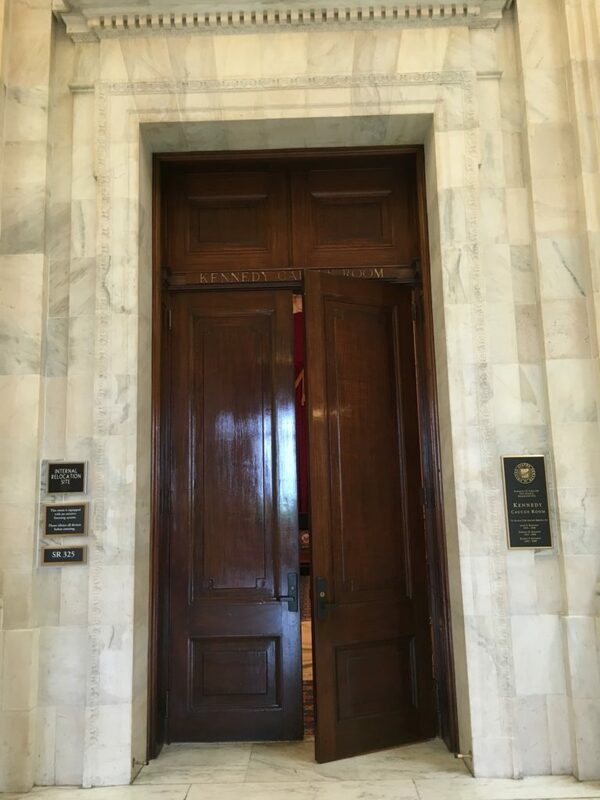 One of the coolest places we hit up was the Kennedy Caucus Room, the site of the Titanic hearings, the Joseph McCarthy-led investigations on communists in the U.S. army, the hearings on the conduct of the Vietnam War, and the meetings of the special committee on Watergate. As we snapped a picture of it, I found it pretty difficult to wrap my mind around how much history had happened in that one room. In Hamilton terms, it really is the room where it happened. Ok, to conclude, get ready. It’s about to get a bit sentimental. Overall, the POPVOX intern adventure was a bit of a ~spiritual~ experience. As we traversed from the House side to the Senate side of the Capitol, I couldn’t help but think, “Here I am, doing what I had dreamed of doing for so long—interning in DC with an awesome organization, walking across the Hill with the Capitol on my left and the Supreme Court and the Library of Congress on my right.” Despite the sweltering heat reflecting off the pavement, I felt terrific. Plus, based on my first week here, I’m sure that I’ll be feeling the same level of excitement everyday for the rest of the summer as an intern with POPVOX. Hopefully, I’ll get to the point where I can navigate the city without Google Maps. The rotunda in Russell. Takes your breath away, doesn’t it? *Get it? Like Health, Education, Labor, and Pensions, the committee? I’m really trying here, guys.